like the video above, could you guys support the sticky date on scale cell or layout？ that we we could let user know which big scale date are they on ,for example they should know current dates is on May or June. There is no built-in option for this, but you can inject a custom DOM element into the gantt container, place it over the time scale and display a visible date there each time gantt repaints or scrolls. 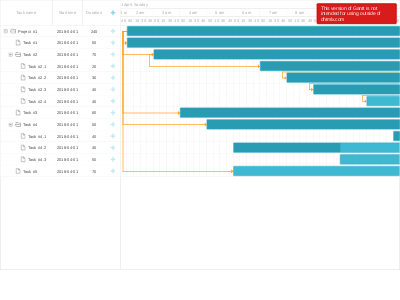 Use onGanttScroll to detect when gantt is scrolled. dateFromPos() method gets the date of the specified horizontal position in the chart area. Created on https://plnkr.co: Helping you build the web.